The large slider indicates the current light level at a glance. 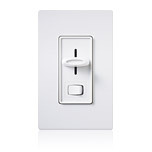 The rocker switch automatically returns the room’s lighting to the user’s favorite preset level. The soft locator light becomes illuminated when the dimmer is in the “off” position, making it easy to find in the dark. The large slider indicates the current light level at a glance. The large slider indicates the current light level at a glance, and the rocker switch automatically turns lights on and off. Dual dimmers also save space by combining controls in one location. The large slider indicates the current light level at a glance. In addition, the eco-dim model guarantees users at lest 15% energy savings compared to a standard switch. The large slider indicates the current light level at a glance. 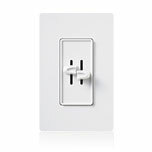 The rocker switch automatically returns the room’s lighting to the user’s favorite preset level. The C•L models with HED Technology improve dimming performance of dimmable CFLs and LEDs compared to standard dimmers.